Apple has announced macOS 10.14 Mojave as their next big release for macOS to be introduced in the Fall of 2018. 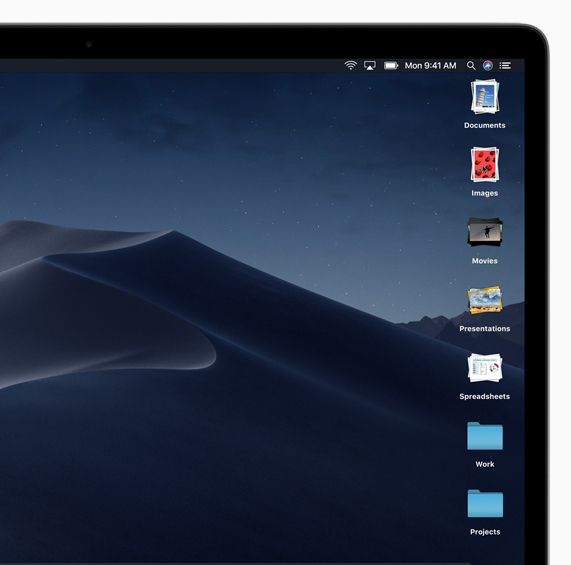 Mojave brings an optional Dark Mode theme, new apps (News, Stocks, Home, Voice Memos), a redesigned Mac App Store, FaceTime with up to 25 people, iPhone/iPad Camera Continuity and improvements to Finder with the ability to organize files on Desktop into groups. Dark Mode with best with Apple’s native apps while Third Party Developers are welcome to support the feature in there own apps with an update. The new finder makes viewing photos easier without having to open them up separately in Preview. Files can be organized into groups on your Desktop and the default background of Mojave can transition from light to dark depending on the time of day. A couple new apps have been released for Mojave: News, Stocks, Home and Voice Memos. The Mac App Store has been redesigned in Mojave and in 2019 Apple plans to support UIKIT from iOS allowing iOS apps to be easily ported over to Mac. The Mac App Store in 10.14 Looks totally different! With Mojave will come the depreciation of OpenGL and OpenCL support, meaning that any games or applications like the Adobe Suite that make intensive use of these things will have to be updated to support Metal in macOS Mojave 10.14. Older versions of the application will still run in Mojave they just can’t be updated by the developers unless they switch over to Metal. While macOS High Sierra was available for machines released as early as 2009 with Mojave for whatever reason is largely limited to 2012 or newer machines, with the exception of some older desktop Mac Pro models. Now Mojave is coming this fall, but it is available through the Paid Apple Developer Program right now. Traditionally macOS has always been offered early for developer testing, however this year Apple is also releasing a Free Mojave Public Beta available for all “Mac” Users that will be available for download in July as an effort to reduce the number of bugs come the official launch date in the fall. like each macOS release is every year. 3 Comments on "Apple Unveils macOS Mojave 10.14 – Coming this Fall 2018"
Updated yesterday my MacBook Air. It works pretty good. I’ll wait until Mojave comes out to update my hackingtosh. I have updated a couple of my hacks, a Z87MX-D3H, i5-4440, GTX660 and a Z97-GD65, i7-4790K, GTX 980 Ti. Both iMac 14.2 Smbios. The Z87MX-D3H was a clean install to a spare SSD. The Z97 was an update from High Sierra 10.13.5. Both took around the same time to complete. Only issue I had was no Nvidia webdrivers available for Mojave, so I had to swap out the 980Ti for a spare GTX660. Nvidia webdrivers are not expected till GM release, i.e. just prior to the main release in September. Not sure/sold on the Mojave Dark scheme, quite like the one that changes through the day. I think it’s pretty cool I’m really liking the improvements to Finder and was able to get everything working. I’ll be posting a guide on it for the others soon.